"The accelerator has you do research to see what the market is and the need is and if there is a need that could be purchased and used. It took us to a new level of how to do business and how to think of what we're doing internally." - Carla Gaouette, senior vice president at Viability. Image via DON TREEGER / THE REPUBLICAN. Local newspaper The Republican and its sister organization MassLive kindly did a story on IA alum Viability’s dedication to innovation and the impact it is having on all it serves. Organizations that innovate will create the largest impact in the world, attract the best people, and secure the most funding. Many local nonprofits tell us they want to become more innovative but don’t know where to begin. Today Innovation Accelerator is delighted to announce our newest offering: UnTether. In this workshop you'll be introduced to the state-of-the-art systems for innovation used by Silicon Valley, National Institutes for Health, the effective altruism movement, and many others. Attendees walk away with tools they can use the next day and gain a deeper understanding of how our Accelerator trainings can help organizations UnTether themselves from restricted funding. Our students get multiple chances to stand in front of the very people who can offer funding for their innovative, revenue-generating pilot programs at our Shark Tank events. Central to making it work are the fantastic funders, both nonprofit and for profit, who volunteer their time to coach the entrepreneurs at these events. Today we are delighted to announce some of our newest funders to volunteer! You can see the full list of our Sharks, and our many other mentors & guest speakers, on our network page. We are now accepting applications for nonprofits interested in Innovation Accelerator’s 5th cohort. There will be rolling admissions until the cohort is filled. Classes begin in April. If you know a nonprofit making developing new sources of revenue a top priority, please feel free to invite them to apply. A limited number of grants to defray some or all of the tuition are available. Innovation Accelerator helps nonprofits build a culture of innovation to increase their financial sustainability and impact. So far this year our alumni raised over $500,000 in funding for the pilot projects they put through the Accelerator. We accomplish all of this by teaching organizations to apply the scientific method to innovation so they can rapidly: come up with new ideas, break them into testable hypothesis, and then go out to gather conclusive evidence. Along the way veteran business & nonprofit leaders from a diverse range of sectors mentor the students. CEP's work is carried out through adult literacy and language education programs as well as through grassroots organizing and action initiatives. Using neuroscience and tech to make top-tier motivational training available to everyone. The Springfield Republican kindly did an article on the graduation of our 3rd cohort. As it appeared only in print, a scan of the article appears below. Last week 14 executives from foundations, granting organizations, angel investor groups, venture funds, and loan funds judged the final presentations of Innovation Accelerator’s third cohort. They were joined by dozens of local business people who came to cheer on the graduates. 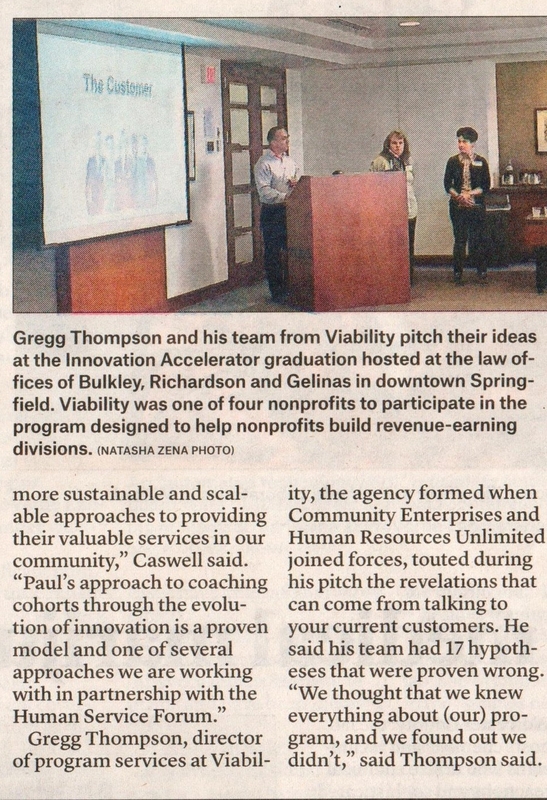 The event was the capstone to a six-month intensive training for five teams of innovators from local nonprofits. Their objective: devise, assess, and pitch new programs that leverage their organizations’ assets to create substantial new sources of mission-aligned (and unrestricted!) revenue. Every team had credible evidence supporting their ideas, each one capable of generating from $1 million to $10 million a year in unrestricted revenue. Students’ confidence in their ability to come up with new ideas and assess them nearly doubled. Students’ ability to identify all of the stakeholders for a project, their incentives, how they can help (or hurt) a project, distinguish between symptoms and root causes, etc… nearly tripled. 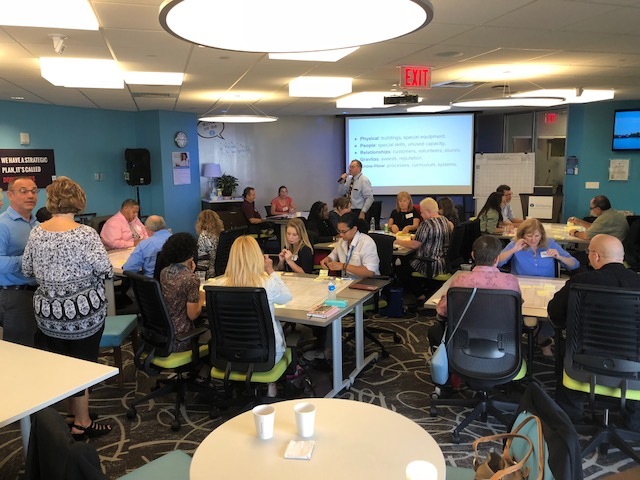 Connector (from Human Services Forum) - connecting the best local training providers to the region’s human service organizations. YesAbility (from Riverside Industries) - importing cutting edge pedagogy from mainstream education to help the intellectually disabled prepare for & stay in the workforce. Digital Skills Workforce Solutions (from TechFoundry) - helping medium-sized employers upskill their workforce’s digital skills. Corporate Inclusion Solutions (from Viability) - training disabled men and women to become superior team members for national employers. 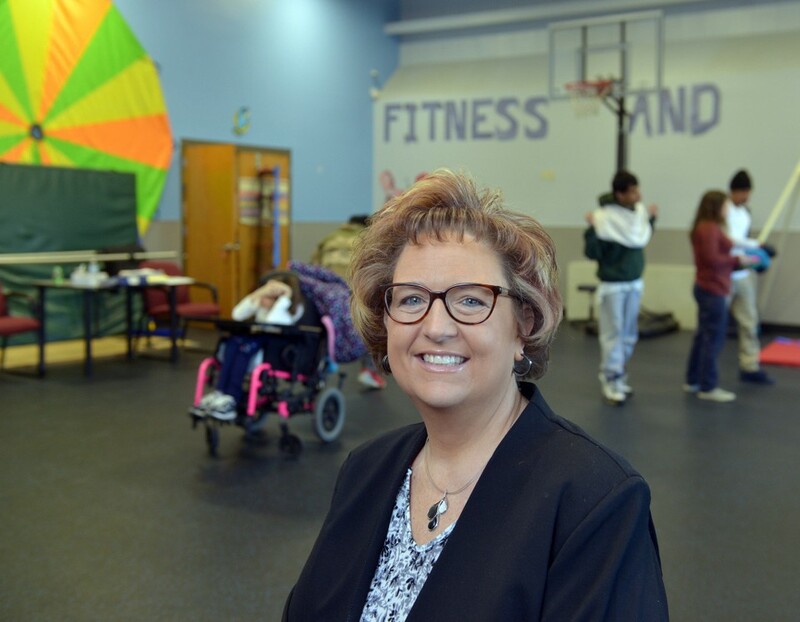 Move to Work (from Viability) - helping nonprofits that serve the developmentally disabled to place more of their disabled clients into meaningful careers. Some of these teams will enroll in our Customer Discovery training, where they will put their top idea to the test and discover if there is potential to create something that can increase their revenue by at least 10%… and all of it in the form of unrestricted funds :). A special thanks to TechSpring for hosting us last night! On 9/26, from 4-7pm, foundation executives, philanthropists, and angel investors will hear pitches from the graduating Innovation Accelerator teams and provide feedback. Alumni of the first two cohorts received $500k in pledged funding for their projects! If you would enjoy attending as an observer we would be delighted to have you there as our guest. See for yourself the impact of our training on nonprofits :). Free Refreshments! Free parking 2 blocks away at the Casino's garage! Convenient, but not-free parking is available in the Tower Square garage. Your role: view graduation presentations, experience what the Innovation Accelerator is really like :). A special thanks to our event partners: Bulkley Richardson & Human Service Forum! "How did you go this far in such a short time?" "I see a lot of presentations. Few are as engaging and informative as these. I want to know more. I want to be involved." "This pedagogy forces you to share your mistakes with outsiders. Few have the courage to do so. But precisely because you chose to be vulnerable in that way, I have learned so much and want to help." These are just a few of the comments made by executives from national foundations to the students at the graduation of Innovation Accelerator's Winter cohort. The Innovation Accelerator is designed to help nonprofits make the most of their limited resources, turning minimal funding into maximum impact (which in turn secures more funding). By applying tried and true principles of entrepreneurship, even the meagerest budget can make big waves in the local or even national community. This graduation was a special one - all the graduating teams came from Solidago, a national foundation located in Northampton, that works to build movements that promote justice, equity, and sustainability. Elizabeth Barajas-Román, Solidago’s CEO, engaged with Innovation Accelerator to bring entrepreneurial systems and best-practices to the program team, and ensure the delivery of effective, impactful, and needed program delivery to the field of philanthropy. The Innovation Accelerator teaches communication skills, tests assumptions, and builds a a base of outside validation and support, allowing the foundation to attract greater partnership with other funders to invest alongside Solidago, lending much greater weight to the name and the awesome organization behind it. If this sounds like a good time to you, you will be happy to know that we are recruiting our Fall 2018 cohort now! My thanks to Pierre for his kind words.